Sales volumes for homes priced above $1 million picked up across the country in early 2014 compared with the previous year, according to a recent report from Bloomberg. That trend is proving particularly true in the Bay Area, where luxury home sales volumes have increased heavily over the past year. Citing data from the National Association of Realtors, Bloomberg’s article says $1 million-plus home sales rose 7.8 percent in March year over year, twice the historical average. Sales above $2 million increased 33 percent from the previous year in January and February, Bloomberg reports, based on DataQuick statistics. Several factors are driving the growth in luxury home sales, including affluent international investors, rising stock prices, and an improving economy. Bloomberg notes that $1 million-plus homes accounted for about 2 percent of all U.S. transactions in February, equal to totals recorded before the Great Recession. Here in the Bay Area, our region’s healthy employment rate is helping fuel vigorous growth in the luxury housing market. 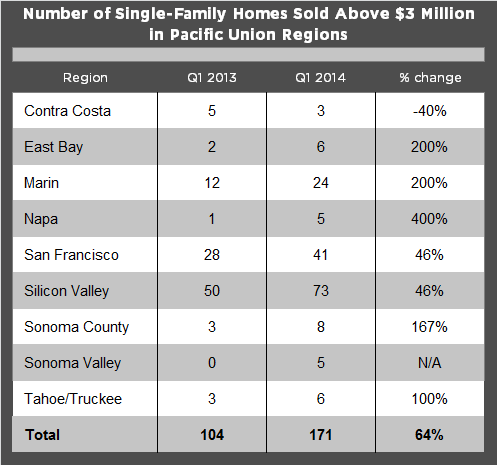 Across Pacific Union’s combined nine Northern California regions, home sales above $1 million increased by double-digit percentage points quarter over quarter, with the largest volume gains observed at the high end of the market. According to MLS data as of May 9, a total of 1,099 single-family homes in our regions sold for more than $1 million in the first quarter of 2014, a quarter-over-quarter jump of 27 percent. Examining individual regions, sales gains at this price point were most dramatic in Sonoma Valley (up 110 percent) and Sonoma County (up 80 percent). Combined sales at the $2 million-plus price point increased an average of 41 percent quarter over quarter. Growth was particularly impressive in the East Bay, Napa County, Sonoma County, and Sonoma Valley, all of which registered triple-digit percentage point price gains during that period. Finally, the top end of the luxury market saw the largest spike in sales volumes, with growth in the $3 million-plus price bracket averaging 64 percent. Volume increased by triple-digit percentage points in five of our nine regions; in Sonoma Valley, five $3 million-plus homes sold in the first quarter of 2014, compared with zero in the first quarter of 2013.